This chair is intended for the benefit and use of the incurable deaf. 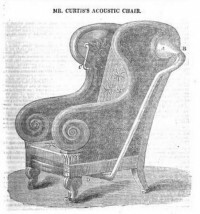 A somewhat similar chair was constructed in 1706 by M. Duguet, who likewise invented some acoustic tubes. But one of the great advantages possessed by my chair over his consists in this, that the person sitting in it hears at the opposite side from that at which he is addressed; thus avoiding the unpleasant and injurious practice of the speaker coming so close as to render his breath offensive and, at the same time, detrimental to the organ of hearing, by causing a relaxation of the membrane of the tympanum. Curtis observes that Cardinal Wolsey was in the habit of whispering in the ear of Henry VIII, and that the cardinal’s bad breath may have been one reason for the king’s ill health in later life. Nothing to do with his chronic over-eating, of course. My Acoustic Chair is so constructed, that, by means of additional tubes, &c., the person seated in it may hear distinctly, while sitting perfectly at ease, whatever transpires in any apartment from which the pipes are carried to the chair; being an improved application of the principles of the speaking pipes now in general use. This invention is further valuable, and superior to all other similar contrivances, as it requires no trouble or skill in the use of it; and is so perfectly simple in its application, that a child may employ it with as much facility, and as effectually, as an adult. It is, moreover, a very comfortable and elegant piece of furniture. Available now from all good retailers, generous credit terms available, etc etc. This chair is of the size of a large library one, and has a high back, to which are affixed two barrels for sound, so constructed as not to appear unsightly, and at the extremity of each barrel is a perforated plate, which collects sound into a paraboloid vase from any part of the room. The instrument thus contrived gathers sound, and impresses it more sensibly by giving to it a small quantity of air. The convex end of the vase serves to reflect the voice, and renders it more distinct. Further, the air enclosed in the tube being also excited by the voice, communicates its action to the ear, which thus receives a stronger impression from the articulated voice, or indeed from any other sound. As for potential customers, it appears that Dr Curtis is setting his sights high. Very high. By means of sufficient tubes, this chair might be made to convey intelligence from St. James’s to the Houses of Lords and Commons, and even from London to the King at Windsor.